Growing up in Louisville, Hunter Thompson was comfortable with the athletes' clique in high school, as well as the hoods and the rich kids. His family wasn't well off, but young Hunter was always welcome at swanky debutante parties, with open bars and no age checks. Thompson and friends also stole a lot of beer, every weekend. If the legends can be believed, he was a heavy drinker by 14. Jailed for shoplifting at 18, Thompson says he has since given up crimes of property. As an Airman Second Class, he wrote a sports column for The Command Courier, official paper of Eglin Air Force Base. Even then he was known for exaggerated or fabricated -- but fascinating -- accounts. He later worked as a copy boy for Time, wrote for National Observer and El Sportivo (a Caribbean tabloid about bowling), was fired from a string of small-town papers, and trashed his home town's most famous sports event in an article titled "The Kentucky Derby is Decadent and Depraved". 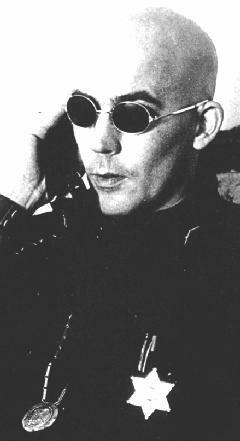 A friend wrote to Thompson that his writing had gone "totally gonzo", which may trace back to the Spanish slang gonzagas (loosely translated, "fooled you"). "Gonzo" has since entered English-language dictionaries as a synonym for "bizarre", but for Thompson it seemed to mean "literary cubism" -- journalism with only the loosest rules. In the 1960s he spent several months riding, drinking, and drugging with the Hell's Angels motorcycle gang, and turned in an article on the topic for National Observer. It became the book, Hell's Angels. Then came Fear and Loathing in Las Vegas, a drug-running road trip across the American Southwest, first serialized in Rolling Stone. Thompson was among the many beaten by police outside Chicago's 1968 Democratic Convention, an event which only made him more politically active. In his last years, he wrote a column for ESPN called Hey, Rube, where his bio always said he lived "in a fortified compound near Aspen, Colo."